Dr. Handel acknowledges that a visit to the dentist can sometimes wrack the nerves, not only for children but also for adults. At Wayne Dental Care, Dr. Handel and his team address these concerns by ensuring patients are as comfortable as possible. Among the many comforts offered in the office are headphones for music and TVs in every room, as well as soft pillows, warm blankets, and lavender-scented cloths for relaxation. 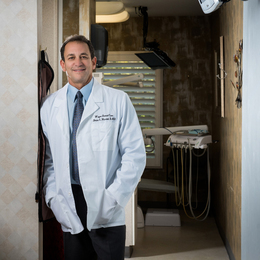 In practice since 1987, Dr. Handel is a graduate of the Kornberg School of Dentistry at Temple University, and he has been named to the “America’s Top Dentists” list six times since 2009. His many industry affiliations include membership in the Academy of General Dentistry, the International Association of Orthodontics, the Academy of Laser Dentistry, the Dental Organization for Conscious Sedation, and the American Academy of Craniofacial Pain, which emphasizes education in TMJ treatment and sleep-related breathing disorders. The son of a World War II prisoner of war, Dr. Handel was the first of his family to graduate from college, and was followed into dentistry by a younger sister, Michelle. He remains committed to the “work hard and help your neighbors” lessons imparted from his blue-collar upbringing in Delaware County. Dr. Handel recently encountered one of those patients with hand over mouth, sad instead of smiling. The woman, only in her 20s, had a host of dental problems, including many broken teeth and rampant decay, caused by a combination of health issues and neglect. The woman’s grandmother could no longer stand idly as dental problems damaged her granddaughter’s life, so she took her to see Dr. Handel. In his care, the young woman’s smile—and her life—improved dramatically.